By Thomas W. Hilgers, M.D. This 1243 page textbook resulted from the life-changing reading and challenge to the scientific community of Humanae Vitae, Pope Paul VI’s encyclical, and thirty plus years of research. 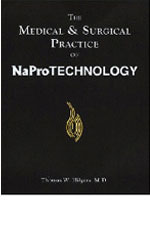 NaProTECHNOLOGY can be defined as a new women’s health science which has, as its main principle, the ability to work cooperatively with a woman’s menstrual and fertility cycles. It uses the CREIGHTON MODEL FertilityCare™ System, which is a prospective and standardized mean of monitoring the female cycle.